Conceived by his Royal Highness the Duke of Edinburgh in 1956, and started in Canada in 1963, the program aims to help young persons develop strength of character, leadership and personal discipline through four sectors of activity: community service, sports activities, skills, and expedition. The awards purpose is similar to the aims of the Air Cadet Program. While this program is run world wide and is not affiliated with the Royal Canadian Air Cadets, 111 Pegasus RCACS and the Cadet Program strongly support the Duke of Edinburgh’s Award program and encourages all cadets to participate. Details on the links between Cadets and Duke of Ed can be found here: www.dukeofed.org/bc/cadets. This is an international youth award program. Over 500 000 young people between the ages of 14 and 25 are involved in projects in over 100 countries. The award concept is one of individual challenge. Everyone works at his or her own pace. It offers youth a balanced, non-competitive program of voluntary activities that encourage personal discovery and growth, self-reliance, perseverance, responsibility to themselves and service to their community. As a cadet, many activities in our program correspond to the D of E Award Program requirements, enabling many cadets to obtain at least the bronze level. To register see the information below or meet with CV Lui who is the Squadron's D of E Award Program Leader. A fee applies to receive the Participant's Record Book which is used to record your progress. The registration fee will be reimbursed by the SSC once you have successfully completed the level that you registered for. Diligence in completing the book is required but well worth it. Print or pick up an application form or register online and "Take up the Challenge"
The Duke of Ed Award looks great on college and university applications, and on resumes. It shows commitment, dedication, responsibility, hard work, and acknowledges your achievements. The award demonstrates that you are a well-rounded individual, who excels at a wide variety of interests and skills. Group member may start with 111 Pegasus D of Ed group at the beginning of the training year, granted that they turn 14 between September 1st and December 31st. However, they still need to be 14.5 years old to complete Bronze award level. Participants can start in any entry level as long as they meet the age requirement. Starting directly at Silver or Gold with no pre-requisite award level(s) obtained is known as Direct Entry. All activities must be completed by the participant's 25th birthday. As of February 07, 2018, Drill is now considered a Skill. Cadets can use Drill for their Skill component, but not for their Phys Rec component. Any Participant already working on their award that has been using Drill for Phys Rec hours can continue to do so until the completion of their current level. All Duke of Ed members must attend mandatory monthly meetings on every 2nd Monday from 2005hrs to 2025hrs, please bring your Duke of Ed logbook. 2. 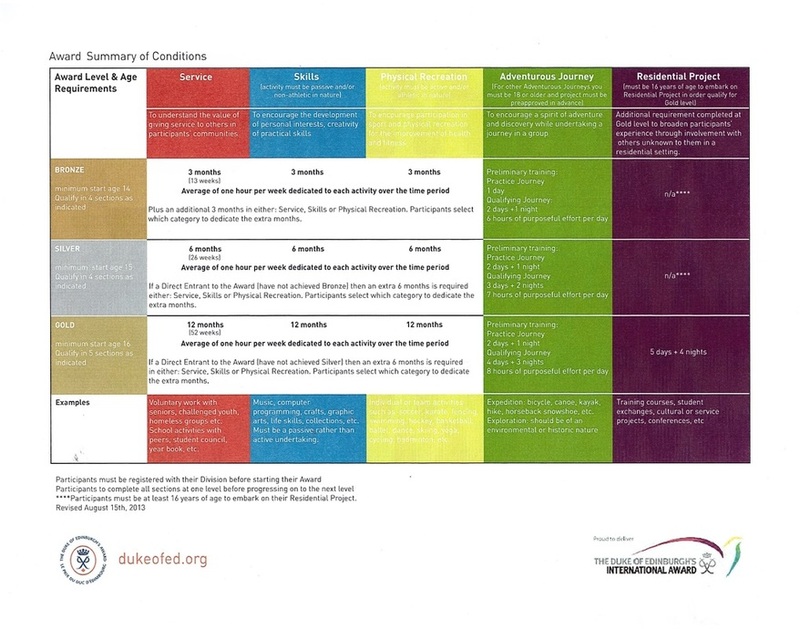 Cadets who are interested in the program may review the starter checklist for a good overview of the program: https://www.dukeofed.org/get-started. There is also a great overview of the links between the Cadet program and the Duke of Ed available here: www.dukeofed.org/bc/cadets. 3. Cadets looking to join the Duke of Edinburgh program as part of the 111 group can register for the program in one of the following two ways. Using either sign up method requires the Cadet to pay a $30 fee to register and receive their booklet. Upon successful completion of a level the SSC will reimburse the fee which was paid to register. Under "Group Status" select "Group Participant"
Under "Name of Group" enter the name of our group which is "111 Pegasus RCACS"
When entering your address into the form please put down your home address but note that your logbook will be sent to the Squadron as you have registered to be part of the group. This option will require that you pay the registration fee by Visa/Mastercard or through your PayPal account. Once you have registered online, you can start your activities on your registration date, as authorized by the D of E program. Your logbook will be mailed to our squadron in about 2-3 weeks. During this wait, record all activities on paper; once you have received you logbook, transfer all logged activities to your logbook. Print out the registration form below and mail it to the address on the form along with your $30 cheque for registration. Your logbook will be mailed to our squadron. 4. Once you complete your level, your certificate and Pin will be mailed to the squadron and the SSC will reimburse the fee you paid to register for the program. Your Pin and Certificate will presented to you in accordance with the guidelines of the program. 5. To make sure everyone who is interested signs up and completes the level successfully, please email CV Lui (dukeofed111air@gmail.com) if you have any questions or difficulty in completing the level requirements. You can find CV Lui on Monday nights. Once all of the requirements for an Award level have been completed, the Submission is sent to the Division Office. Applications are reviewed by the Division Office. If there are minor problems with the application, we will contact the participant by phone or email to correct the mistake. Submissions with major problems will returned with a letter detailing the areas requiring attention. Awards can be resubmitted once corrections have been made. Approvals for Bronze and Silver typically take around 4 weeks. Gold approvals take 4-6 weeks as they must be approved at the Division and National level. During busy periods, such as the end of the school year, approvals may take longer. At each level, participants are given a pin and certificate to honour their achievement. Pins are generally sent to the group leader (except Gold) or directly to the Achiever if he/she is an Independent. Certificates are generally presented at Award Ceremonies, but Achievers can indicate on their submission form if they would prefer it be mailed to them or their group leader. At the Bronze level, Achievers can attend a Division organized ceremony or they may attend a ceremony within their group. At the Silver level, certificates are presented by the Provincial Lieutenant Governor or the Territorial Commissioner. These ceremonies are organized by the Division Office and generally take place a few times each year. At the Gold level, certificates are presented by either the Governor General of Canada or a member of the Royal Family. These ceremonies are organized by the National and Division Offices and generally occur every two or three years. Achievers will be notified of upcoming ceremonies by email through Eventbrite, so please ensure the email provide is one that is checked often. Participants who would like to attend a ceremony in another province or country should contact the Division Office to request a transfer. Please note that Achievers can only be on one Division's waitlist at a time. 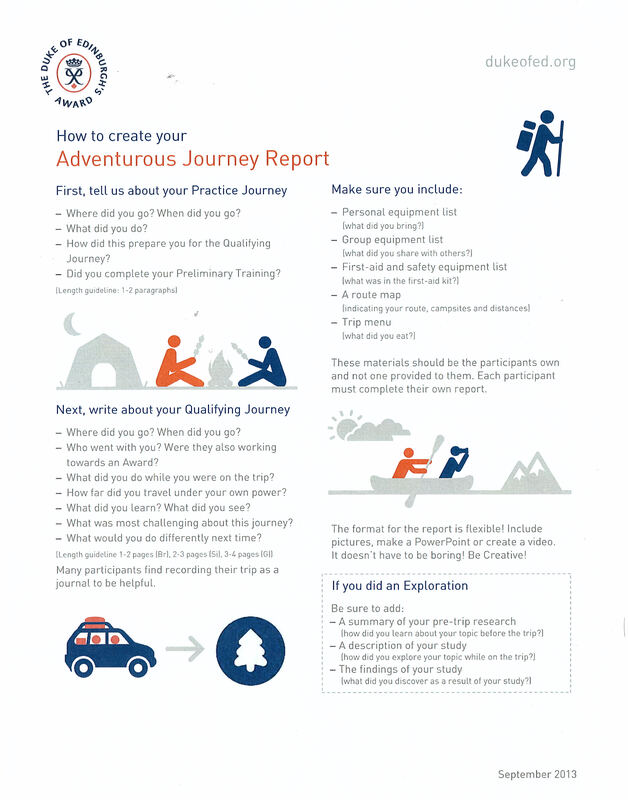 An adventurous journey report outline. This outline is a guideline only, so cadets can be creative in the choice of mediums in preparing your report. Remember, pictures on the report are always a good addition! 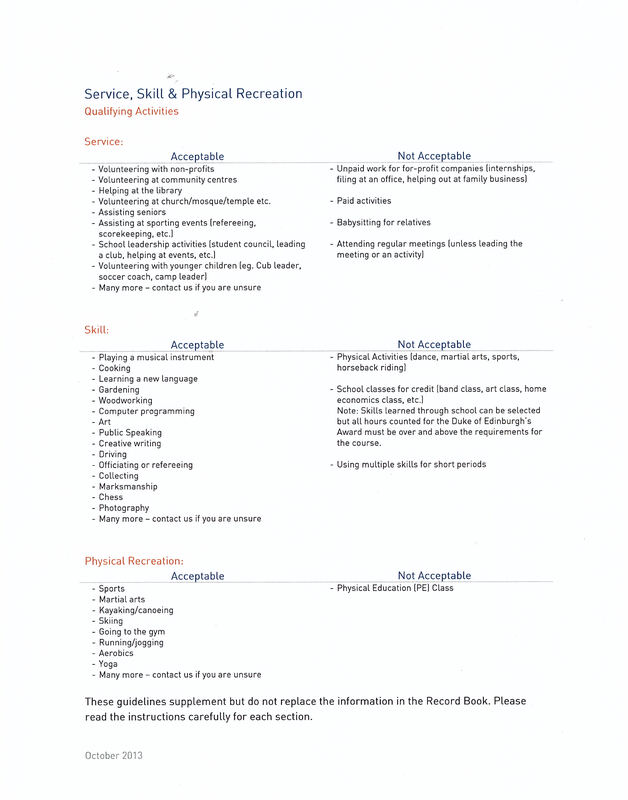 The Record Book Supplement - this document contains supplemental information which adds detail to what is included in the candidate record book.